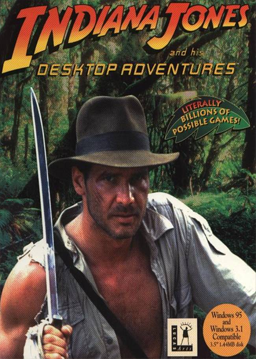 Indiana Jones and his Desktop Adventures was a casual adventure game in the Indiana Jones series released in April 1996, which was an early, not successful, entry in the now popular casual adventure game market. There is no music and no voice work as it was meant as a simple time waster (there is even a hide key to hide the game when your boss was looking). The story, the puzzles, and the game world are randomly generated, so each game is different. Each game is meant to be played quickly, it should take no more than a half an hour to play each game. Indy is controlled with the keyboard and the mouse button is used to control actions and solve puzzles. The game is now out of print, although since it was sold at retail, it can still be purchased on the used games market.